After yesterday’s breathtaking start to Race 2, the Tall Ships Races 2017 fleet is making good progress towards Klaipeda in Lithuania on Tuesday (25 July). “The fleet is making fast progress with winds continuing to come from a northerly and north-easterly direction. The quicker vessels are already rounding the south end of the island of Gotland and starting their run across to Klaipeda. “It will be an interesting last reach across the Baltic Sea with some of the larger ships, led by the Russian ship, Mir, more than holding their own with some of the smaller and often quicker vessels. Let’s see what the morning positions bring. “Will the weather hold in the present very favourable sector? There is a change forecast for later in the week. “The fleet has made excellent progress in the first 24 hours of Race 2 and are still benefitting from northerly winds,” he said. As the crews get into the rhythm of life aboard many will be getting accustomed to being in a watch system for the first time in their lives. Charlotte Gray, 15, is one of the trainees who sailed on Challenge Wales in the Cruise-in-Company between Kotka and Turku. She said that she enjoyed the experience of being in the watch system, whereby crew take it in turns to do shifts around the clock, despite initially finding it a daunting prospect. “I enjoyed the shift system as it enabled me to see parts of the day that are very beautiful such as the sunrise and the sunset which we don’t usually experience in day-to-day life,” she said. She also said the experience taught her a lot about teamwork and she would encourage everybody to take part in sail training. “For me the most valuable lesson I learnt was teamwork and the ability to form a close-knit and effective team from a group of people who were previously strangers,” she said. As well as attracting a record number of visitors to Turku for the fleet’s fifth visit to the Finnish city, the Tall Ships Races 2017 is also attracting a huge online audience. During the fleet’s visit last week, social media channels operated by the host port logged record traffic with the Tall Ships Races Turku 2017 Facebook page getting more than 20,000 likes during the event and posts on the page reaching nearly 800,000 Facebook users. People logged on from all over the world to view compilation videos of the action packed four-day visit, iconic images and a time-lapse video of the fleet leaving the River Aura on Sunday. More than 30,000 people logged on to view a live stream of the Crew Parade on Friday. 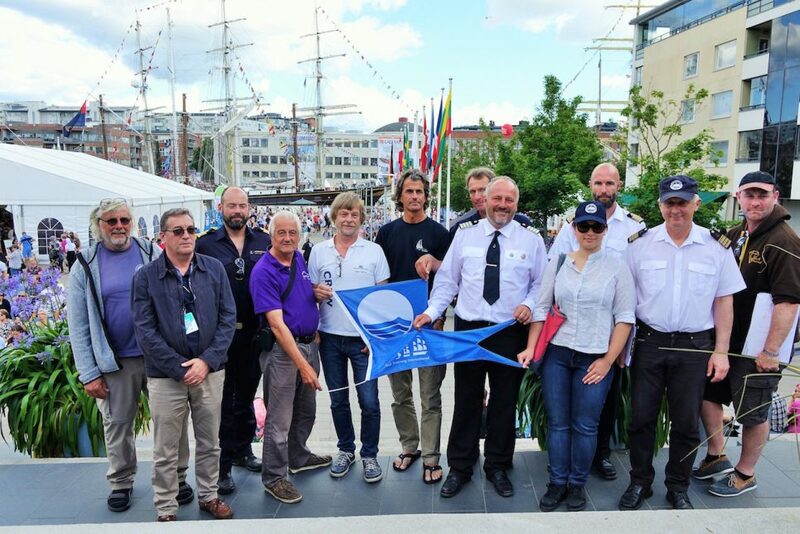 Before setting sail from Turku, the captains and skippers of the 12 vessels in the fleet signed up to the Blue Flag Scheme taking part in the Tall Ships Races 2017 gathered after the Captains’ Briefing. “On its 30th anniversary, Blue Flag is very proud to be a partner of Sail Training International (STI). We have seen the number of vessels flying the Blue Flag rise over the years of our collaboration, which means more and more captains are willing to join us in our efforts. The fleet is scheduled to arrive in Klaipeda by midday on Saturday 29 July.